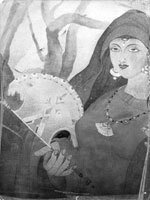 Characterisation of 'woman' in Punjabi literature is unique in more than one ways. For instance, she is portrayed as the lover rather than the beloved -- the ma'shooq of Persian ghazal; she is described as a member of the female collective -- trinjan or aatan; she is shown in the dialectics of mother-daughter relationship and finally the poet entirely or frequently assumes the voice of a woman. Shah Hussain sings entirely in a woman's voice; Bulleh Shah, Sachal Sarmast and Khwaja Farid frequently do this; Guru Nanak, Sultan Bahu and countless others resort to it occasionally. Punjabi poetry shares this characteristic with Hindi and Sindhi poetry. I am told by my friends versed in Bengali, Tamil etc that all languages in South India have this feature. Its origins may lie in the distant past when South Asia was largely matriarchal. But in no other language, it is used by major classical poets as widely and significantly as in Punjabi. According to Najam Hussain Syed, this characteristic has class connotations. That dervishes or malangs call each other Sahaily -- a girl's girlfriend -- indicates that there exists a political/philosophical tradition to support Najam's view. Late Professor Asif Khan viewed it in terms of linguistics -- a manifestation of mother as the keeper of mother tongue. This is borne out by the fact that the generation of women in Punjab now in their 80s are all veritable treasure houses of idioms and proverbs, tellers of tales and singers of songs. But something more is needed than these hypotheses to study all the nuances of this feminine voice in Punjabi poetry. Shah Hussain, being the most significant poet in this regard, may help understand the phenomenon in its entirety. The story of Heer, the quintessential Punjabi female, is used by all Punjabi classical poets but the range of contexts Shah Hussain puts it in is as extensive as comprehensive. His verses like Nee ma'ay mainoon Kherian di gal na aakkh (Mother, do not talk to me of Kheras), Buray aan, buray aan way asseen buray aan way loka (we are bad, bad, bad, oh people, we are bad) and Chuhree haan darbar di (I am the despised cleaning woman of the court) express themes of class, as well as of culture and history, explained through the feminine experience. A comparison of his poetry with that of Mian Mohammed Bakhsh, the last of the Punjabi poetic giants, clearly shows why Punjabi poetic tradition is different from other literary traditions like the Persian one as far as this feminine voice is concerned. Contrary to Shah Hussain's poetry, in Mian Mohammed Bakhsh's poetry it is the male Mahinwal who is brought to the court of Sohni, the potterwoman. He writes: Paer nahin turya raway, pohnchaan ja darbar (I do not have the feet that could take me to Sohni's court). Mian Mohammed Bakhsh, though very well versed in the Punjabi poetic tradition, was also very impressed by the Persian tradition with the latter being almost diagonally opposed to the former. Though Punjabi has borrowed some words, some genres like mathnavi, some meters and some mythology from Persian, may be because of it being the language of the court and the medium of instruction, the entire pantheon of Punjabi poets from Baba Farid to those writing in the 20th century live in a different world. Both the traditions are as different as male and female. Until we understand this gender difference, we cannot understand the essence of Punjabi poetry and its meanings. Ivan Illich once remarked that women have a sense of history while men, by dint of their nature, don't. This role can be reversed. There are men who behave like women in this regard and women who act like men. But in a race for competitive possession of property, most men and women cast themselves in a mould which determines success or superiority on the basis of economic position. Classical Punjabi poets fought against this worldview. You cannot understand or interpret Punjabi poetry until you look at it from this humanistic and Marxist point of view. In fact, we tend to forget that all major religions and revolutionary movements professed this ideology. The fact that Ludden, the bourgeois boatman in Waris Shah's Heer, had changed much since Damodhar wrote about him three hundred years ago, shows that Punjabi poetry is deeply rooted in history. A century later in Sachal Sarmast's poetry, Heer's story becomes even more comprehensive in its scope and philosophy. Waris Shah created a Heer entirely different from what others have written about. She is an arrogant feudal in the opening passage of the book but one look at Ranjha and she is transformed. Ranjhay uth kay aakhya wah sajjan. Heer huss kay tay meherban hoee (Ranjha woke up and exclaimed my dear! Heer laughed and bestowed all her kindness). Thereafter Heer is the goddess of love and compassion, guiding Ranjha at each step. Ranjha, when he met Heer, was already a transformed person, having renounced property and the feudal way of life in his native Takht Hazara. Waris Shah, however, puts him in situations where the regressive side of his personality becomes most vividly manifest. He is, after all, a man. He starts sermonising when Heer is betrothed to Khera asking her to obey what in his view is the word of Quran. This shows that there is hardly any difference between the male of 18th century Punjab and the one coming from the present generation. Both are Ranjha in regression -- the authoritarian male who thinks his superiority has religious and moral sanction. Waris Shah seems to be well aware of the poetic tradition of Ramayan which describes Sita endlessly cursing Ram for his male chauvinism. Many people think Ranjha ought to have behaved like Mirza Jat or Maula Jat but when the poor fellow tries to be like them, Waris Shah starts laughing at him. That true creativity lies in love is shown by the female and not the male. Not the kings, the warriors and the complaisant priests can lead us back to the Eden of human love and fellowship. It is woman -- the creator, the nurturer and the oppressed -- who has been the keeper of essential human heritage. She embodies language, love, history, song and story and this is what the essence of Punjabi poetry is. Punjabi poets use the feminine gender because the song started with the feminine yearning for fulfillment. Woman sings not of the manliness of man and all his aggressive and warlike postures, but of humanity and love juxtaposed against property, possessiveness and aggression. Freud has written that love is the only hope for human beings but it is not possible as long as there exists the institution of property. In a society characterised by property and possession, woman also becomes a piece of property and an object of pleasure. Her song is about changing this dispensation.